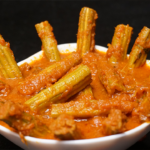 drumstick curry recipe is a simple side dish called as munagakaya tomato curry in my mother tongue telugu. Drumstick Curry Recipe is a simple side dish called as munagakaya tomato curry in my mother tongue telugu. This curry is made of drumstick vegetable. this curry is prepared in most south indian kitchen with very little variations. some chose to add either potato or eggplant to this.